Join the discussion on our forums! Come discuss Soup Vendor over in our dedicated Soup Vendor discussion topic. Whenever you restore 3 or more Health to your hero, draw a card. Fresh from the floor of the arena! Some ways to trigger this guy's effect include Earthen Ring Farseer, (healing + 3/3 minion) Flash of Light, (effectively draw 2 cards), Benevolent Djinn, (get a card at the end of each turn if you can keep both alive), Uther of the Ebon Blade's 5/3 lifesteal weapon, a powered up Paragon of the Light, or your classic Holy Light. Might work in Heal Paladin with Flash of Light to effectively draw 2 cards. It says 3 or more, so I think you will only draw one card. It can't. The game will "understand" you healed for 1, twelve times. Really wished it was restore 3 or more health to a friendly character. 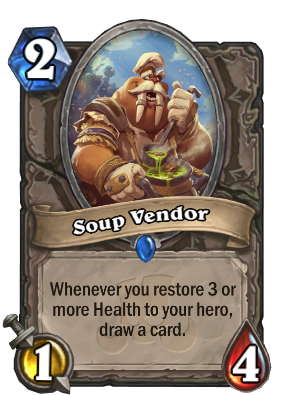 Soup Vendor is already fairly good because it has premium stats. Drawing even once is going to be REALLY good, and the tanky statline can make sure it sticks. Curves into Benevolent Djinn, works with Chillblade Champion and Zilliax in Paladin. It could be run in a Kingsbane Rogue if you feel a little spicy. Technically you could put it into Heallock too. If healadin actually becomes a thing then this card will be the reason why it ultimately works. Other than that, I dont see many decks that use this effectively. Zoo Warlock doesn't need draw and doesn't even run many card that heal more than 2. Maybe discard Warlock can consider this since they will run Jeklik? It just seems to be really clunky, although it can potentially draw you a lot of cards. MAybe it'S the key to getting Combo Paladins to work, since they usually lack draw. Probably arena only. Good flavour though. Funnel cake flavour - yum! Zilliax just keeps getting better and better. A free card when you purchase 3 or more health. Djinn might actually be one and only reliable and cheap way to play this card. @Healpaladin Yes, all those cards are great! And Zilliax for sure will be the one. Refreshment Vendor and Soup Vendor UNITE! It is difficult to heal 3+ HP in the early game unless you're specifically playing Odd Priest, but this is not an odd card. It can only be a good card in the late game and playing a 2 mana 1/4 just to draw a card and healing your hero is not really that worth it. Would be interesting interation with Healing Rain. If it heals it for 12, will this draw you 4 cards? or just one as it’s a one spell. I don't think it would draw anything since you heal for 1 twelve times rather than healing for 3 four times.